With more than a decade in the field of PCB prototype and fabrication, we are committed to meeting the needs of our customers from different industries in terms of quality, delivery, cost-effectiveness and any other demanding requests. As one of the most experienced PCB manufacturers in China, we pride ourselves to be your best business partners as well as good friends in the every aspect of your PCB needs. Through the years we are proud to have been keeping an on-time delivery rate of 99%. We know, apart from PCB quality, the other most important factor is the shortest possible lead-time, which is crucial for engineers’ R&D works, especially in the stage of prototyping. We work in three shifts to make sure your PCBs will be on your desk as agreed up and as early as possible. PCB is one of the most crucial parts of any electrical and electronic devices. The quality of PCB determines the quality of all these devices. The modern technology makes possible the increasing miniaturization of integrated circuits, higher packing density and smaller layout dimension, hence the higher demands on PCB arise. SMT PCB Assembly Manufacturers In China.We Offer a Full Range of Printed Circuit Board Capabilities to Fit All of Your PCB Needs. 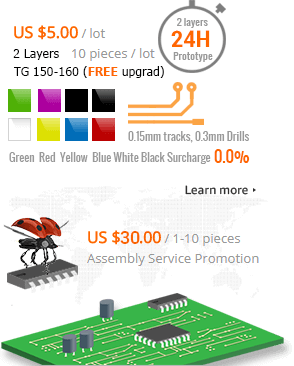 Just like PCB business, our PCBA services also specialize in prototyping and small-volume production, making PCBWay the one-stop destination of boards fabrication and assembly. This arrangement makes your R&D work easy and time-saving. Fulfilling hundreds of orders daily from around the world, we have established us as the leading supplier of PCB and PCBA services for our consistent quality and excellent services. Our Surface Mount PCB Assembly capability is a key service offering and supports much of our manufacturing activity. Two high speed Pick and Place machines give us the ability to place up to 28000 components per hour in a variety of package types. All our PCB processes are fully RoHS compliant. Our customers all over the world! A way for every creative students to change their ideas into reality,and finally making the world a better place to live in.